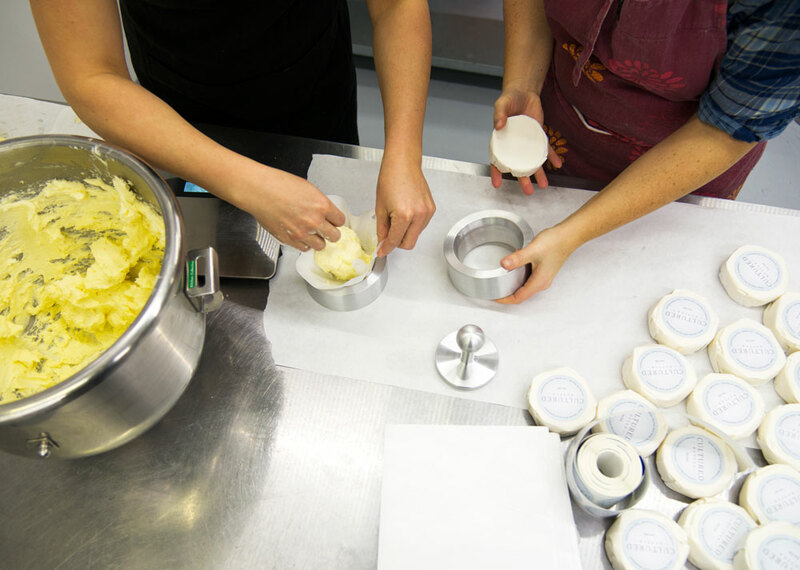 Small-batch butter maker Kristie Lee churns out a fresh supply each week. 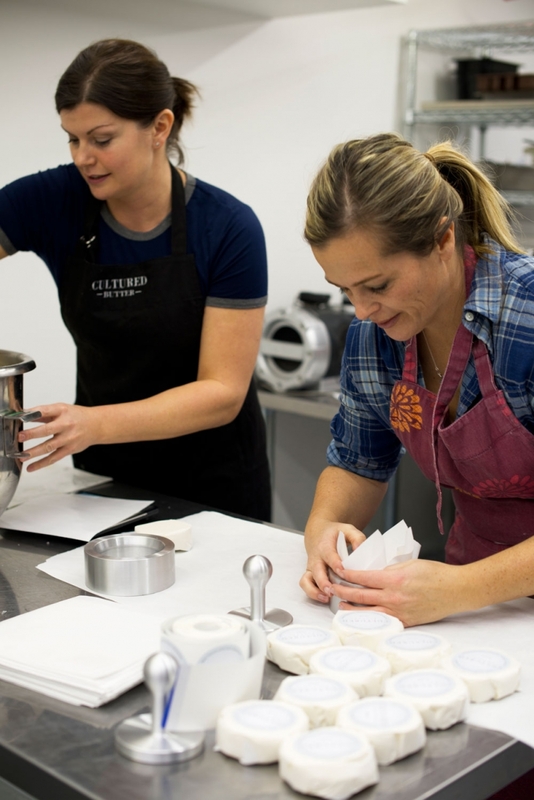 It’s been less than a year since Kristie Lee started Cultured Butter, but in that short time her small-batch butter business has gone from a table at the Hillhurst-Sunnyside Market to selling her wares in a dozen local shops, and with good reason. Lee’s intense focus on making a local-as-possible, handmade product makes for butter that is richly flavoured and well worth seeking out. Lee’s process begins with local sweet cream – about 100 litres each week. 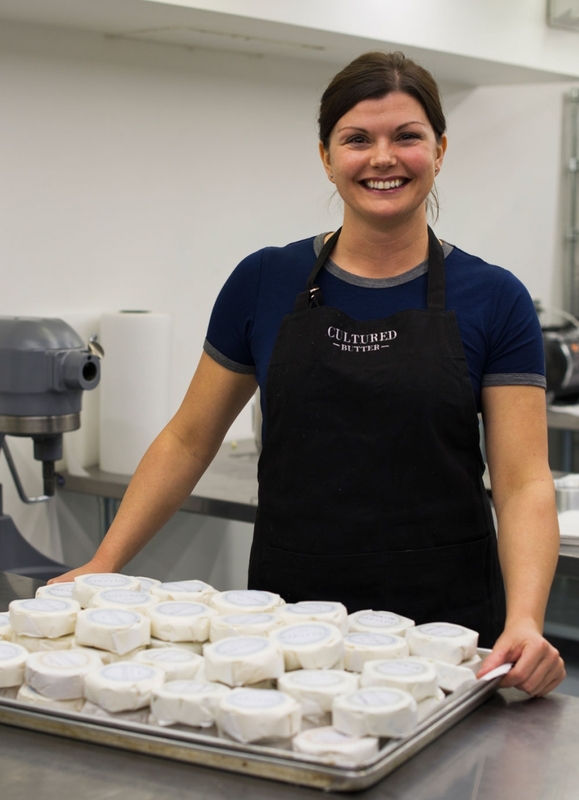 She gets as much cream as she can from the grass-fed cows at Rockridge Dairy, topping up her supply with cream from other Alberta producers. The colour of the cream (and thus the butter) varies seasonally with the amount of fresh grass in the cows’ diets: lots of grass means a rich golden yellow butter. Before churning, the cream is cultured for two days. That process, like yogurt-making, uses a bacterial culture that eats up the lactose, leaving lactic acid that gives cultured butter its distinct tangy flavour. After churning, each small batch is washed by hand, and the buttermilk is squeezed out, also by hand. This yields a final product with a higher butterfat content than regular butter. Lee says she’s had a lot of help along the way. 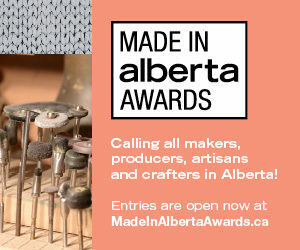 Alberta Agriculture, for example, was eager to help connect her with dairies that supply her with cream. Friends from her former career in oil and gas now work with her (here, Elaine Pohl helps package butter). Another friend custom-machined the butter presses they now use to pack each round of butter. 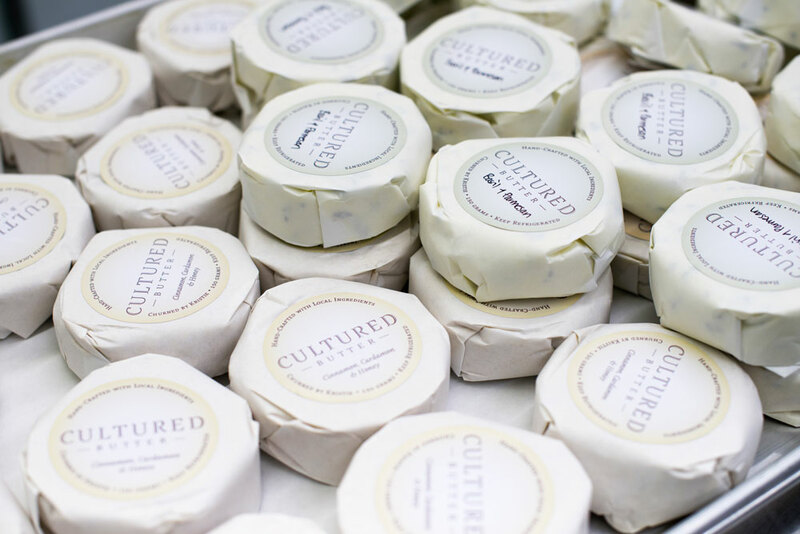 Cultured butter uses ingredients from local suppliers like Gull Valley and Basil Ranch to make her regular lineup of flavours that includes sea salt (the most popular), porcini, shallot and rosemary, chili and garlic, basil and parmesan, caramelized onion and date, and cinnamon, honey and cardamom. 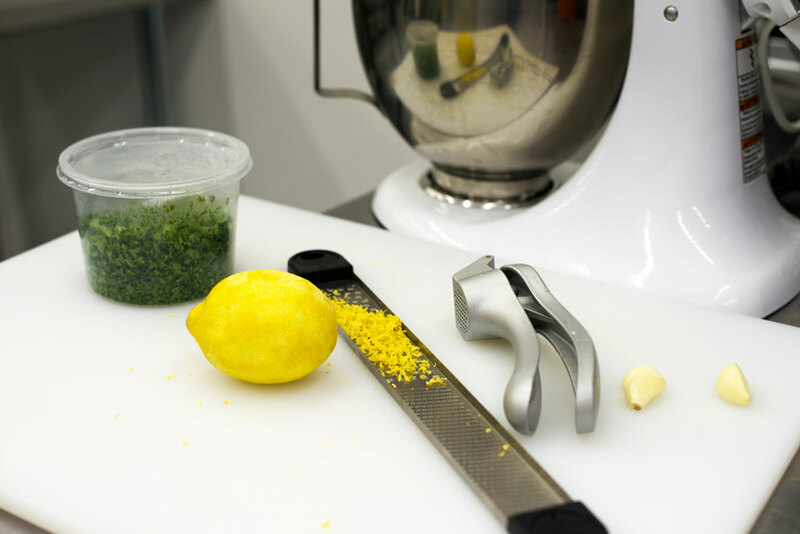 Depending on what is in season and locally available, Lee adds limited edition flavours – here they are about to make a batch of parsley, lemon and garlic. 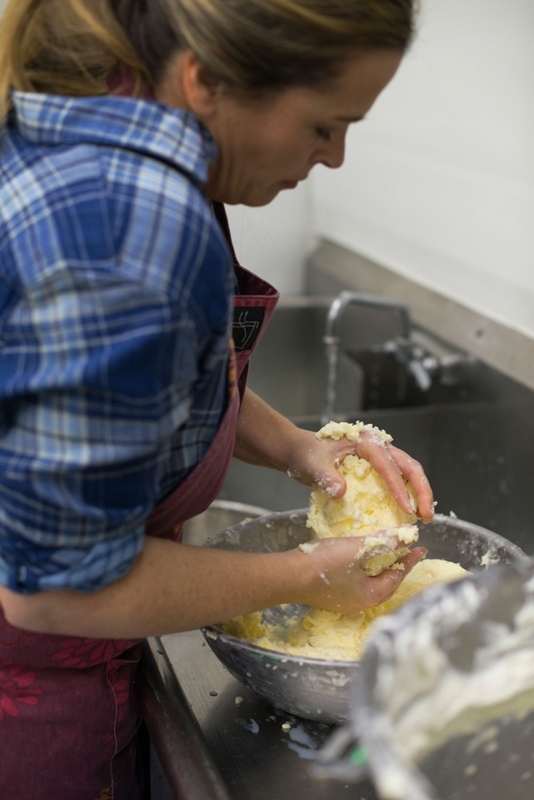 Lee churns up a fresh batch of butter every week, the salt, herbs, spices and other ingredients are added, and then the butter is packaged, labeled and hand-delivered, so it is always ultra-fresh. Cultured Butter’s products are best enjoyed on a good-quality bread (as you’ll find it served at Frenchie Wine Bar. The cinnamon, cardamom and honey variety is divine on pancakes or waffles. We recommend any flavour melted and poured over popcorn for a real treat, or incorporated it into your favourite butter-forward recipe. Basil parmesan shortbread, anyone?